Now more than ever, women want to feel beautiful and confident. Susie feels so strongly that every woman should be her most beautiful, radiant, sparkling best that she has made it her mission to spread the word. 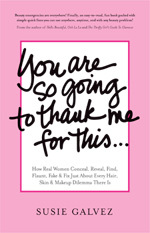 With a flair for leaving her audiences feeling energized and ready to dive into life, Susie helps women tap into their beauty, wisdom and style. She teaches skills that build their confidence and gives them the where-with-all to successfully connect with everyone they meet. Susie is an international beauty expert, day spa founder, esthetician, makeup artist, author of nine books, international spokesperson, and radio show co-host of "Girlfriend We Gotta Talk!". First Class? or Bulk Mail? Women who take the time to appropriately wear makeup and look professional earn 30% more than women who "can't be bothered." 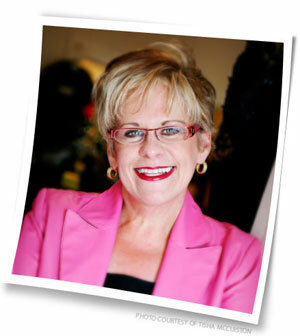 In today's challenging economic times, looking good has never been so important for your career! It only takes five seconds to make your first�and lasting impression. Whether you are perceived as First Class or Bulk Mail, depends on just about everything that is you ~ your clothes, your hair, your makeup, your attitude, your body language, your eye contact, and more. In this highly interactive program participants will learn specific, easy-to-implement tips, techniques, and ideas that will take their professional image out of the mail room and into the board room. Just About Every Beauty Dilemma There Is! You want to look and feel beautiful, as you struggle to manage your career, the kids, friends, exercise and more, who has the time...or the money? So what if you are not the perfect "10." None of us are. Whether you have many commas in your net worth, or just one decimal, looking like a million bucks is not about spending the most money ~ it is all about knowing when to splurge and when to economize. This fun program shows you how to work your best assets, limit your liabilities, showcase your uniqueness, and how to refine and define...even on a dime! Each program can be delivered in keynote, full-day, half-day or workshop format. For more information contact Susie@SusieGalvez.com or call 804-364-7113. "Susie Galvez is the Paula Deen of beauty! Full of southern charm, wit, and beauty advice with a dash of sass!" 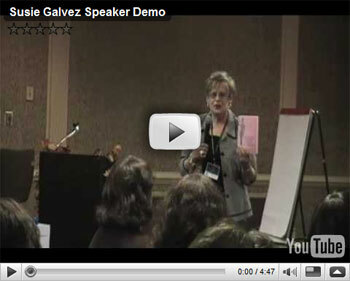 "Susie Galvez truly speaks from her heart. Her witty, entertaining, and interactive style is refreshing, fun, and leaves you feeling beautiful and motivated!" "Laugh and learn! That's what makes Susie one of those special speakers. After hearing her speak, women always feel good about themselves and excited to use her tips to look - and feel - more beautiful." Contact Susie today to bring sparkle to your next event!